As some of you may have already heard, I spent much of December moving from Hawaii to Missouri. Generally, when I tell people this, they ask if I am crazy. 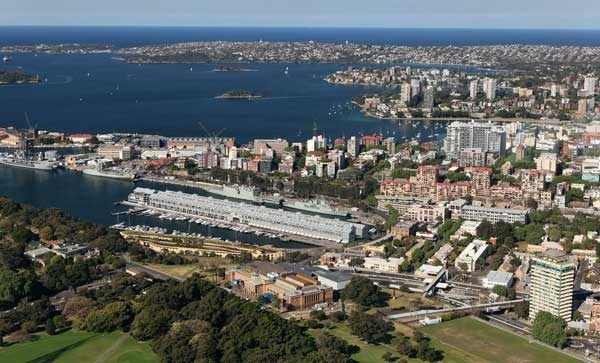 One important reason for the move is work-related, as it will be much more convenient, and less expensive, for me to travel from the center of United States than from Hawaii. A second reason is that my wife and daughter were missing our relatives in Missouri, and wanted to move back. Personally, I would have preferred to stay in Hawaii, but I got outvoted. Are You a Full-Time or Part-Time DBA? I’m always trying to find out about the DBAs who visit my blog, as it helps me to better understand them, which helps me to better target the blog posts I write. While I use Google Analytics to help me find out more about my audience (such as how often they visit or what countries they are from), I also run regular polls to find out even more information. 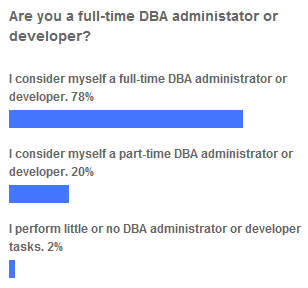 In my latest poll, I wanted to find out how many of my blogs visitors were part-time or full-time DBAs (administrators or developers). I wasn’t really sure what to expect, and in fact, I am a little surprised that about 80% of my blog’s visitors consider themselves full-time DBAs. The reason I am surprised is because when I make presentations at user groups or at free training events, generally less than half of the attendees are full-time DBAs. On the other hand, when I speak at paid conferences, such as PASS or SQL Server Connections, the majority of attendees are full-time DBAs, although they rarely exceed 75% of the audience. Not a tsunami, but high surf on the Kohala Coast, near where we live. We received the first phone call at 4:35 AM Saturday morning. My wife answered the phone, and I figured that it was a wrong number or some friend or family calling from the mainland, forgetting about the time difference. I didn’t listen to the conversation, going quickly back to sleep. At 5:45 AM we received our second phone call. This time I put my pillow over my head to avoid hearing the phone conversation, but it didn’t work because this time around my wife shook me and called my name. I groggily uncovered my head from the pillow, and she said that this was the second phone call about a tsunami warning. Starting Wednesday, December 9, 2009, I am on vacation until Monday, January 4th, 2010. Instead of traveling somewhere else for my vacation, I will be staying home in Hawaii, catching up after a busy year of travel. I attended 7 major conferences. I traveled to Cambridge, England (to visit with my co-workers at Red Gate Software), 2 times. I made 33 public presentations, speaking to 1,853 attendees. I gave presentations in 21 different cities. I gave presentations in 6 different countries. I traveled just over 135,000 miles by air; I didn’t keep track of rental car miles. I traveled 125 days,which included staying overnight at hotels, private homes, and in airplanes. I knew I had traveled a lot, but I hadn’t realized that I was on the road for 125 days, a record for me. I am already planning my travel for 2010, and I think I will try to reduce my traveling, although it will certainly still be a busy travel year. This is the new home for my new blog, SQL Aloha. Instead of posting blog entries at www.SQLServerCentral.com and www.Simple-Talk.com as I have done in the past, I will be posting all of my blog entries here, and then syndicating the blogs back to those websites. This new website will allow me to keep all of my SQL Server-related content in a single location. I will also use it for my presentations, travel schedule, and much more. As you can see, the blog is in beta right now, and won’t be officially go live until September 2009. If you have any feedback in this early beta stage, please let me know.